The Settle to Carlisle Line is one of Britain's most scenic and historic rail trips. And to think, Britain almost lost it -- and I almost missed it. Great railway journeys are usually taken by people who are keen railway enthusiasts or who plan a vacation specifically to enjoy a particular famous railway. I'm not one of these people. I take trains because, in the UK, they are often the most practical way to get from point A to point B.
I also hate having to change trains mid journey. So when I discovered that, because of what the British call "planned engineering works" on the fast West Coast Line, I had to take an alternative route from Carlisle to London one Sunday, I was not happy about it. The journey meant a change at Leeds. It was also going to take twice as long because of lots of local stops. I buried my nose in a magazine and prepared for a long, boring trip. The train climbed out of Carlisle. About 40 minutes later, we were traveling through some of the most beautiful and lonely country I had ever seen in the UK. In March, the great high, gently rolling pastures were wintry pale and sere. There was not an animal in sight. The tracks seemed to snake along a high valley with mountains rising on either side. For several miles we crossed countryside marked and divided by stone fences. No houses, no trees. Just small fields, separated by dry stone walls, their kinks and curves defining centuries of divided inheritances and local property claims. That's when I noticed people with binoculars and knapsacks, hiking boots and travel guides all around me. The couple across the aisle were studying maps and brochures. I asked if they knew where we were and learned the story of the Settle to Carlisle Railway, one of the Great Railway Journeys of the World. Northern Rail operate the Settle to Carlisle line and tickets can be booked through them, online. For the best information on the schedule for this great railway journey, visit the Settle-Carlisle Partnership website and click on their "Tickets, Times and Travel" page. The Settle to Carlisle line follows natural paths high up on the Pennine Way. When it was built, in the mid 1870s, it was planned to carry passengers up to Scotland by a fast route. Because of this, it is usually several miles from the villages named on its stations. Dent Station is four miles away from and 600 feet above its village. Kirkby Stephen station is 1.5 miles away from the market town of the same name. The effect, as the line wends its way between the North Yorkshire Dales to the east and the Lakeland Fells to the west, is of traveling through completely abandoned country, bleak, alien, monochromatic and strangely beautiful. By the time the line reaches the Ribblehead viaduct, near the end of an hour and forty minute short but magical trip from Carlisle, it is in the midst of the Three Peaks of the Yorkshire Dales. The Three Peaks Walk, a difficult but popular 25 mile hike, visits the summits of three distinctive hills, all over 2,000 feet - Pen-y-Ghent, Whernside and Ingleborough. From the train, as we chug across the Ribblehead Viaduct, we can see groups of walkers and cyclists who will board the train at Ribble Station, waving at us. Today, this stunning railway line serves locals and visitors to the Yorkshire Dales and runs virtually round the clock. But that was not always the case. From the 1960s to the 1980s, Britain's railroads went through a pretty rocky period. As the nationally owned railroads were sold off, various government bureaucrats believed the maxim "less is more" and many of the country's smaller and more remote railway lines were closed. The Settle to Carlisle line survived an effort to close it in the 1960s and came very close to closure in the 1980s. At least 32,000 people objected. The line was finally saved from the ax in 1989. Today it is operated by Northern Railways and has become so popular that capacity has been doubled. It runs virtually round the clock. 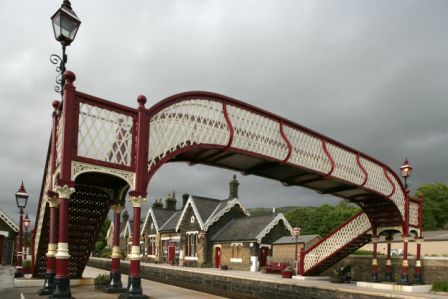 This great railway line is supported by a group of voluntary organizations, known collectively as the Settle-Carlisle Partnership, who have been responsible for restoring the line's distinctive, award winning Victorian stations. When the Settle to Carlisle Railway, faced closure in the 1980s, it was said that the campaign to save it was waged by 32,000 people and one dog (a fare paying passenger too). Ruswarp (pronounced "Russup"), a Border Collie was the inseparable companion of Graham Nuttall, one of the leaders of the campaign. Ruswarp's paw print was the only canine "signature" on the petition. In 1990, about a year after the line was saved, Nuttall,41, and Ruswarp, 14, disappeared while walking in the Welsh hills. Nuttall's body was found near a stream, eleven winter weeks later. Beside him, still guarding his master, was Ruswarp. The dog was so weak he had to be carried off the mountain. Ruswarp was cared for by a local vet. He was awarded the RSPCA's Animal Medallion and collar for vigilance and its Animal Plaque for intelligence and courage. He lived only long enough to attend his master's funeral. According to an eyewitness, reported in the Westmoreland Gazette, Ruswarp sat quietly through the ceremony, only letting out a mournful howl as the coffin disappeared behind a curtain. In 2009, a life-sized statue of Ruswarp was placed at Garsdale Station, the highest station on the Settle-Carlisle Railway and said to be Nuttall's and Ruswarp's favorite spot. The dog looks across the tracks to an empty bench on the opposite platform, dedicated to Nuttall. Which Train? What Time? How Much?